Huntley is a village in McHenry and Kane counties, Illinois, United States. As of the 2010 census it had a population of 24,291, and as of 2017 the estimated population was 27,207. It is a part of the Chicago metropolitan area. Huntley is in the southern part of McHenry County and the northern part of Kane County, 48 miles (77 km) northwest of the Chicago Loop. Neighboring communities are Lake in the Hills to the northeast, Algonquin to the east, Gilberts to the southeast, Pingree Grove to the south, and Hampshire to the southwest. Undeveloped rural land is to the northwest. According to the 2010 census, Huntley has a total area of 14.102 square miles (36.52 km2), of which 14.07 square miles (36.44 km2) (or 99.77%) are land and 0.032 square miles (0.08 km2) (or 0.23%) are water. As of the census of 2000, there were 5,730 people, 2,324 households, and 1,756 families residing in the village. The population density was 489.1 inhabitants per square mile (188.8/km2). There were 2,501 housing units at an average density of 213.5 per square mile (82.4/km2). The racial makeup of the village was 94.94% White, 0.44% African American, 0.17% Native American, 2.13% Asian, 0.00% Pacific Islander, 1.26% from other races, and 1.06% from two or more races. 4.28% of the population were Hispanic or Latino of any race. There were 2,324 households out of which 31.2% had children under the age of 18 living with them, 67.3% were married couples living together, 5.9% had a female householder with no husband present, and 24.4% were non-families. 20.7% of all households were made up of individuals and 9.9% had someone living alone who was 65 years of age or older. The average household size was 2.47 and the average family size was 2.85. In the village, the population was spread out with 23.3% under the age of 18, 6.1% from 18 to 24, 31.3% from 25 to 44, 22.0% from 45 to 64, and 17.4% who were 65 years of age or older. The median age was 37 years. For every 100 females, there were 95.5 males. For every 100 females age 18 and over, there were 91.8 males. The median income for a household in the village was $60,456, and the median income for a family was $65,433. Males had a median income of $44,524 versus $30,363 for females. The per capita income for the village was $27,451. 2.8% of the population and 1.9% of families were below the poverty line. 2.2% of those under the age of 18 and 1.9% of those 65 and older were living below the poverty line. Huntley is governed as a village with an elected village president and a six-member board of trustees. Trustees are elected at-large to four-year staggered terms. The village president is Chuck Sass. The village is served entirely by Consolidated School District 158. Originally headquartered in Huntley, the administration offices have since moved to a new campus in Algonquin. The village used to be entirely served by an elementary school and a high school located in town, but the growing district has since discontinued use of those buildings, and has since built five elementary schools, two middle schools, and a high school on three different campuses districtwide. Only one campus is within village limits. The Harmony Road Campus in the western part of the village contains Huntley High School and Leggee Elementary School. The other two campuses, which serve parts of Huntley are located in nearby Algonquin and Lake in the Hills. The Huntley Area Public Library District includes all of Huntley, parts of Lake in the Hills and Algonquin, and portions of Grafton, Rutland and Coral Townships. The Huntley Area Public Library district serves all of Huntley as well as portions of Lake in the Hills and Algonquin. The library used to be housed in a very small 1,000 or 2,000 sq ft (190 m2) building at Algonquin Road and Church Street. In 1999, the former building was closed and a new 15,000 sq ft (1,400 m2) building constructed on Ruth Road, just north of Main Street. The district's community college needs are served by McHenry County College, located in Crystal Lake, about a 15 to 20 minute drive to the northeast. The village is located along the "Golden Corridor" of Interstate 90/Northwest Tollway. It has direct access to I-90 via a full interchange at Illinois Route 47. Conversion of the interchange from an eastbound interchange to a full interchange was completed in November 2013. Illinois Route 47 serves as the chief north-south artery in Huntley. Handling over 20,000 vehicles a day, Route 47 was expanded from two to five lanes in 2011. Portions of Route 47 between Kreutzer Road and I-90 are six lanes. Route 47 connects to Woodstock to the north and Pingree Grove and Elburn to the south. Algonquin Road and Main Street/Huntley-Dundee Road act as the village's primary east-west routes. Algonquin Road is a four-lane divided highway that connects Route 47 to other suburbs to the east like Algonquin and Lake in the Hills. Main Street connects to Marengo and Harmony roads on the west (leading to U.S. Route 20 and towns like Marengo, Hampshire, and Union), while Huntley-Dundee Road connects to the Carpentersville-Dundee area to the east. Other important streets in the village include Ruth Road, Reed Road, Kreutzer Road, Haligus Road, Del Webb Boulevard, and Church Street. Reed and Kreutzer are local east-west roads, while Haligus, Ruth, and Church are local north-south streets. Del Webb Boulevard is the primary collector road in the Sun City neighborhood. The village is located along a branch of the Chicago & Northwestern Railroad, and thus many of the village's industries are near the railroad for convenient access to Elgin, Rockford, Chicago, and the rest of the continent. Turkey Testicle Festival: held the day before Thanksgiving at Parkside Pub, usually spreading into the streets of downtown Huntley. Northwest Herald – daily newspaper based in Crystal Lake which serves the greater McHenry County area. Northwest Herald MyHometown – Northwest Herald's Huntley MyHometown homepage. Huntley Farmside – weekly newspaper edited in St. Charles (Kane Co.), published in Downers Grove. Sun Day – Biweekly/Weekly newspaper published by White Silo Media, Inc.; serves the communities of Sun City and Edgewater in Elgin. ^ "History of Huntley, Illinois". Huntley Area Public Library. 2010. Archived from the original on December 18, 2006. Retrieved 20 March 2010. 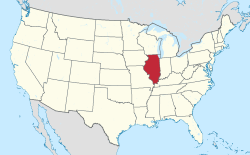 ^ a b c "Annual Estimates of the Resident Population: April 1, 2010 to July 1, 2017 (PEPANNRES): Illinois Incorporated Places". U.S. Census Bureau. Retrieved February 12, 2019. ^ "Huntley village, Illinois – Population Finder". American FactFinder. United States Census Bureau. 2008. Retrieved 20 March 2010. ^ a b "Huntley village, Illinois – Fact Sheet". American FactFinder. United States Census Bureau. 2000. Retrieved 20 March 2010. ^ "Huntley village" (PDF). Census 2000, Summary File 3. Northeastern Illinois Planning Commission. 16 February 2004. Retrieved 20 March 2010. ^ "Geographic Identifiers: 2010 Demographic Profile Data (G001): Huntley village, Illinois". American Factfinder. U.S. Census Bureau. Retrieved February 12, 2019. ^ "G001 – Geographic Identifiers – 2010 Census Summary File 1". United States Census Bureau. Retrieved 2015-08-03. Wikimedia Commons has media related to Huntley, Illinois. This page was last edited on 12 February 2019, at 15:57 (UTC).